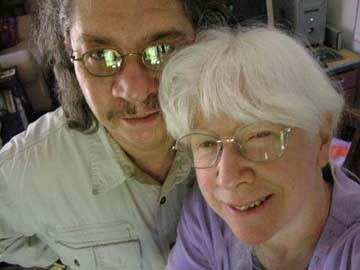 Here's a picture I took of Jimmy and me, back on June 20, 2006, before he left on his annual trip to Grayling, MI, for the Trout Bums Picnic, where he hangs out for a week with all his bamboo rod making fly fishing pals from around the world. And I'd just been home two days, after my week of teaching at QSDS 2006, one of my few teaching jobs that year, soon after I'd stopped being Eva's nanny and taking that 1.5 year teaching sabbatical. Now it's almost four years later (March 30, 2010), and I'm happy to be home, in the studio, but also happy when I get "out" to teach at other workshops, like the Hudson River Valley Art Workshops class I just did last week. In 2008 I received the "Teacher of the Year 2008" award from Professional Quilter Magazine, and it helped put me back to the level of teaching schedule I'd been used to, before I ducked out to take care of Eva. Time really flies! At left is a detail of "Turtle Woman," 45"h x 39"w, from 1992. This is a good example of my very embellished period's work, and it was the first piece I made that glowed in the dark. I'm a painter, and I also sew. I've done both, as well as lots of drawing, writing, and clay work, since I was a small child. My art tells stories about my life and the world around me, from my vantage point in Northeast Ohio. My work has become like time capsules of the life around me, including my political commentary and private stories. Both of my degrees are in Studio Art, specifically Painting, from The College of Wooster (BA 1981) and Kent State University School of Art (MFA 1986). But I consider myself to be an Outsider Artist, because I don't fit in with either what we think of as the current painting tradition or with the regular art quilt part of the art world. I write as much as I possibly can on my work, usually beginning the art by drawing first with an airbrush on cotton fabric, then airbrush painting the colors in, and writing over the colors with my airpen, making whole cloth quilted paintings. But sometimes I use paint markers for the first line drawing, and sometimes I choose regular brushes to paint in the colors. I always prefer airpen for the tiny writing with crispy rich lines, which I add to the piece a little at a time, over several days to several months. I mostly machine quilt my paintings or sell them unsewn, as frameble paintings. I really prefer machine "crazy grid" quilting now for sewing the great big pieces I started doing in 2005. I still like to add a row of hand sewn running stitches with perle cotton, around the edges of my art quilts, as my way of finishing the work, and as a nod to all the hand sewing I used to do. I used to embellish my work with not only huge amounts of hand stitching, but also lots and lots of tiny glass beads. It took many months to finish most of my pieces then. But now I prefer to let the detail created by my airpen writing and drawing to be what intrigues the viewer, and the sewing has become very secondary to the painted composition in my current work. This switching to machine quilting is because I've realized that it's the storytelling: the pictures and the writing, which are important to me. Not how the piece is sewn, not the texture. Anyhow, the tiny writing itself makes a new texture, which I'm enjoying exploring the strengths of, when you consider that the viewer may not read it at all. Now it doubles as pattern. At left is a detail of "Wilma (Peace Voodoo)," 66.5"h x 66.5"w, made in Oct and Nov, 2005. This is very large piece with many days of airpen writing on it, after airbrush painting the main lines of the forms and the colors. I machine sewed it with my crazy grids, and sewed by hand around the border, which I also wrote on. 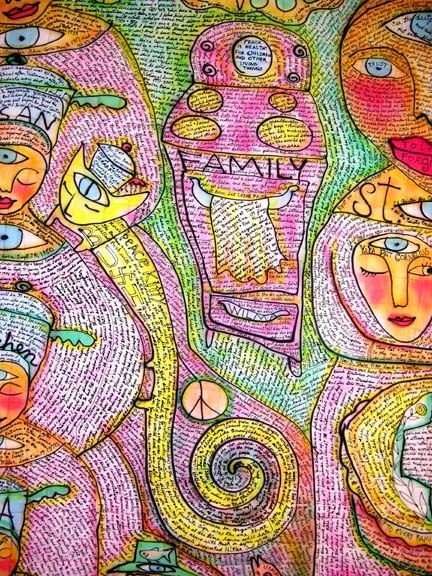 This is one of my favorite pieces - about the women in my family and current events of the times. Of course, hurricanes that year, 2005, were a big part of it, and so was Eva's first birthday and her Croup. Rosa Parks died while I was making Wilma. I write what comes into my head, as diary writing, and also sometimes paraphrase articles about current events or histories. I also began transcribing other people's stories that they give to me, and speeches, etc, from news events, in the last few years. So that kind of writing mingles with my own spontaneous writing. The work is the first and last draft, because I thrive on spontaneity and don't mind making misspellings that I can correct by crossing out. I might also leave the word misspelled. That is part of how we write, when we allow our real ways of working to show. Though for years I didn't sketch first, now I make sketches for my very complex pieces, but they are meant to help me make decisions about what forms and concepts I'll put into the piece I'm going to paint. I don't want to look at my sketches when I draw on the cloth, so I can make really fresh lines and shapes. Another reason I don't copy from sketches is that I noticed a long time ago that I became analytical when I'd copy from a sketch. I'd cling to its lines and forms, wanting to reproduce them, and really stiffened up. Now I make sketches sometimes, but I put them all away before I draw on the blank fabric, and just consider the sketching or diary work I've done ahead of this as all warm-up work, leading me to the place where I'm ready to jump in and make my statement, all fresh and new, on the piece itself. I think a few sketches are fine, to get some energy flowing, but never to actually work from. When it's time to work on the art piece, I want to just dive in there and flow: Let 'er rip! Watching my work grow as it naturally develops is very helpful for keeping myself curious and engaged in the making of it. I believe that letting the work just pour out of me as a direct channel from my inner self, unjudged, makes it my best art, and this is the purely creative, innocent state of artmaking that I enjoy most. I hope others will learn this way of keeping the inner and outer selves connected through artmaking, because I think it's very, very healing, an antidote to the high levels of stress in all our lives. 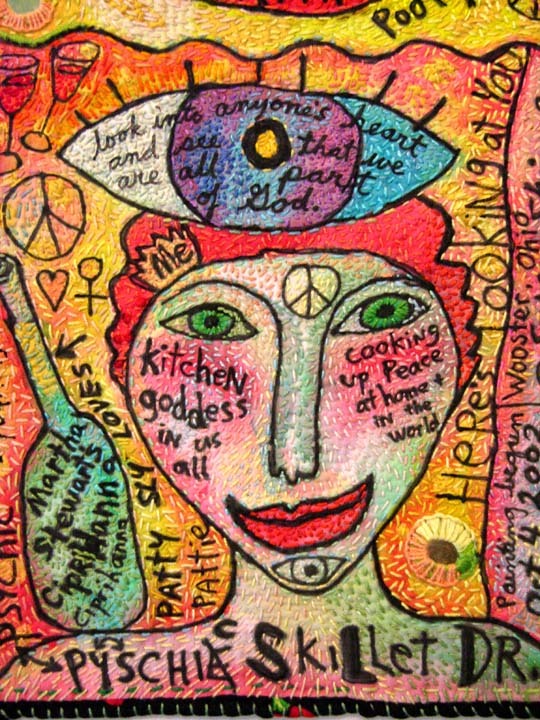 My work is personal diary work with themes focusing around the kitchen and family, St Quilta the Comforter (my made up character, based on my mother), astrology, tarot, peace, and the environment, with a whole lot of emphasis on peace and compassion-centered politics. I'm more political now in my art than I've ever been before, partly because I spent a year and a half being the nanny to my granddaughter, Eva. Being with a very innocent soul so much of the time made me more aware of how important it is for our world to be a safe and whole place for her generation to grow up in. The children really do depend on us, and remember: Peace is healthy for Children and other Living Things. Since 1989 I've taught adult art workshops around the country, with an emphasis on painting and art quilting. Now I'm adding a couple of new classes: Beginning Drawing and Cloth Books, to my list of offerings. I feel that too many art quilters have never learned to draw. In these classes you'll focus on life drawing, really learning how to see what we're drawing and go for realism. In my Quilted Paintings for Books class, you'll make small, narrative paintings to sew and bind into a story book. 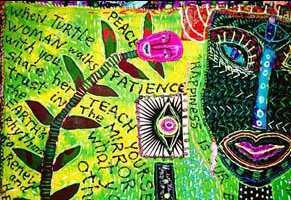 My main focus will remain my classes in which I teach students to let go and trust their inner creativity, using spontaneous drawing, writing, and painting on cloth - Diary Quilt Paintings. I teach using the airpen, as well as brush painting, everywhere I go, but only teach airbrush at my Turtle Art Camps at my home studio. I hope you can study with me sometime. Above is a detail of "Sweet Patooty," 20.5"h x 10"w. 2002 - 2006. This part is roughly the lower half of the piece, which is a whole cloth painted quilt with heavy hand stitching. I don't work this way anymore, with all this hand stitching, but I still paint this way. Now I put in tons of much smaller writing, rather than beads and stitches. Web site created by Susan Shie and Jan Cabral ©1997. All subsequent work done by Susan Shie ©1997 - 2010. This page updated by Susan Shie, March 30, 2010. Web Site Programming by Key to the Web, Ltd. ©2010.